We made this fun Bunny Burger for dinner the other night using Morning Star Veggie Burgers, Bunny Mac & Cheese, and Carrots! It’s very easy to make! You can make any burger and just take a extra bun to make the details on the face. You could also use any white cheese like provolone. We pinched off a small piece from the burger to use for the pupils. 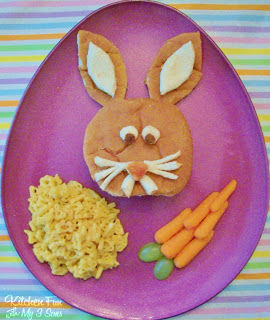 Just cut the white part of bun to make the whiskers, teeth, inside of the ears, nose, and eyes with kitchen scissors. We used just a little bit a ketchup on the nose to make it look pinkish. We shaped some raw carrots into a big carrot and cut 1 green grape in half for the stem. 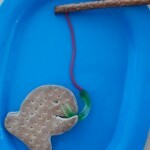 Super easy and the kids will love it for a special Easter Dinner! That is bunny is so cute! 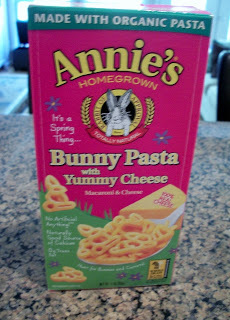 Love that you served it with bunny pasta. How fun! 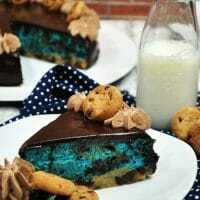 I might just have to make this! This is so adorable and I bet it was fun to eat! We'd love to invite you to link it up at our Beautify It Monday party going on now at Bringingbeauty.blogspot.com! That is adorable! 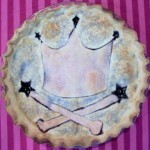 I would love for you to share this (and any other creations) at my new linky party "Pin It and Win It Wednesday" at http://www.cheapcraftymama.com! Your ideas are so cute and clever, I hope to see you soon! How adorable! What a cute idea! !